The Chronography of 354 AD. Part 1: title page and dedication. Die Calenderbilder, Berlin (1888) figure 3. This monochrome photograph comes from Codex Vaticanus Barberini latinus 2154 (=R1), via STRZYGOWSKI, figure 3. The monogram contains the letters which make up VALENTINE FLOREAS IN DEO (Valentinus, may you flourish in God). The triangles contain the text FVRIVS DIONYSIVS and FILOCALVS TITVLAVIT. (Furius Dionysius Filocalus illustrated this work). 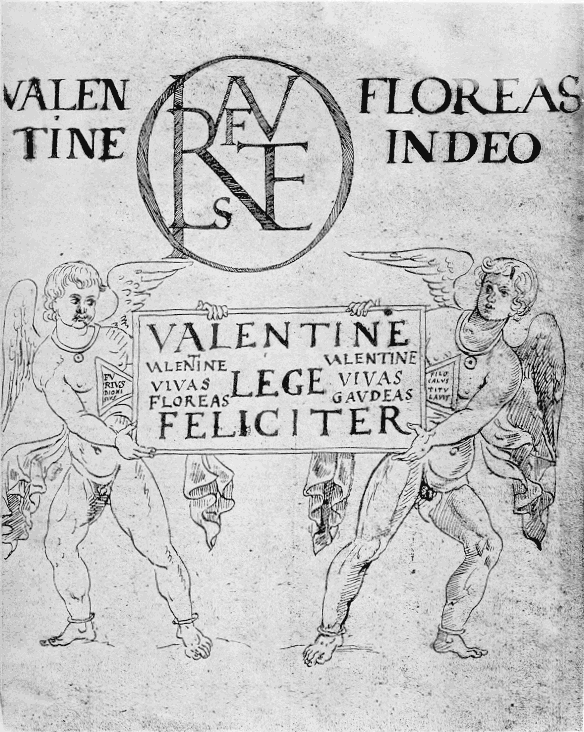 The main text reads VALENTINE LEGE FELICITER (Valentinus, enjoy reading this), on the left VALENTINE VIVAS FLOREAS (Valentinus, may you live long and flourish), on the right VALENTINE VIVAS GAVDEAS (Valentinus, may you live long and rejoice).